The logout button, which will take you back to the initial login screen. The Group / Hierarchy selector, where you can select your current group and hierarchy. The settings button, where you can change your account settings. In the navigation bar below you can switch between Reports, Ad-Hoc-Reports and Documents. In each of these sections, you can filter the view by selecting All (showing all items), Favorites (showing only the items that have been marked as Favorite) and History (showing all the items that you have previously opened). In the search bar, you can search for strings. The button on the right of the search bar lets you switch between showing the items in tile view or list view. Tap the Group / Hierarchy selector. The following screen appears, allowing you to select your report group / hierarchy like in Jedox Web. This changes the set of reports shown in the app and also modifies the storage destination of Ad-Hoc-Reports in Jedox Web. This section allows you to configure your account settings, security, filtering, screen orientation and caching options. Store password: If you choose this option, you don’t have to enter the account password every time you want to log in to the account.Do not choose this option if your device is accessed by people who aren’t allowed to log in to your Jedox account. Auto login: If checked, Jedox Mobile automatically logs in to the last used account without showing the login screen again. You can disable this feature later by logging out of the active session and editing your account. Enable Touch ID: This option is only available on devices with Touch ID support. If checked, your Touch ID (fingerprint sensor) is required every time you want to log in. This adds another layer of security to your account. In some cases, it might be sufficient to save the password but require the Touch ID in order to log in. 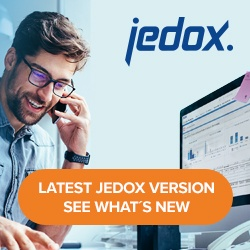 Filter by device: If enabled, only reports suitable for your device are shown that have been previously tagged either as “phone” or “tablet” in Jedox Web (see Tags in Jedox Mobile). Load with predefined orientation: If enabled, the screen orientation is turned according to the tag that has previously been set in Jedox Web (landscape or portrait, see Tags in Jedox Mobile). Enable offline mode: If enabled, each time a connection to a Jedox instance is established, new documents are downloaded to the device. They can be accessed through the app later on even if there is no connection to a Jedox instance anymore. Timeout: You can set a timeout after which the login process is stopped, and it is assumed that the server is not reachable. This timeout can be increased if a slow connection is used to prevent the app from timing out in the login process. By tapping on the star-shaped button, the report is marked as a favorite and is from then on accessible in the Favorites section below the navigation bar. You can rename a report by tapping the Rename button. Note: Report names must be unique (it’s not allowed to have two reports with the same name). You can duplicate or rename Ad-hoc Reports by tapping the Duplicate or Rename button. Please note that Ad-hoc report names must be unique (it’s not allowed to have two Ad-Hoc reports with the same name). Tapping on the star-shaped button will mark the Ad-Hoc report as a favorite and it will then be available in the “Favorites” section below the navigation bar. By tapping on “Delete”, an Ad-Hoc report can be deleted from the server. Tapping on the star-shaped button will mark the document as a favorite and it will then be available in the Favorites section. A document can be renamed by tapping on the Rename button. Note: Document names must be unique (it’s not allowed to have two documents with the same name). The navigation bar is described in the article Mobile Reports & Documents.